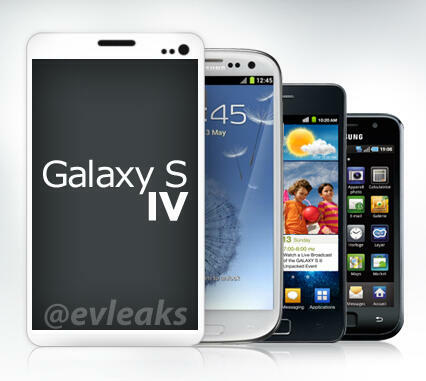 A few minutes ago, the very reliable @evleaks took to his Twitter account to post two images of what could be our first look at the upcoming Samsung Galaxy S4. This Twitter account is known for being fairly spot-on with his leaks and predictions of phones in the past, but the images of this Galaxy S4 look quite different from the earlier Galaxy phones Samsung released in the past. First off, the square-edged design that this device is sporting looks a lot different from the S3 before it, something that we had assumed Samsung had wanted to keep. Even though we wish they did, it’s hard to believe that Samsung would get rid of their “iconic” home button and move towards on-screen buttons instead, which this image suggests. The rectangular design does match up with the reported S4 cases that we saw the other week. The specs listed in one of the images also somewhat match up with what has been rumored so far, but there isn’t even so much as a Samsung logo to be found on either of the two pictures. We have heard rumors either way on whether or not the device will sport a FHD Super AMOLED or not. This leak suggests that it will. Evleaks is usually pretty spot on with what he finds however, so this could be close to what we will end up seeing on March 14 at the Unpacked event. Then again, this could be far from what we will actually see, and at this point, we just don’t know. What do you think? Is Samsung going to finally do away with their home button? Or is this a placeholder render to throw us all off until the unveiling?